Francesco Piemontesi and the HR-Sinfonieorchester Frankfurt under Manfred Honeck perform Mozart’s Piano Concerto No. 25 in C major, K. 503 at the Alte Oper Frankfurt on March 27, 2015. 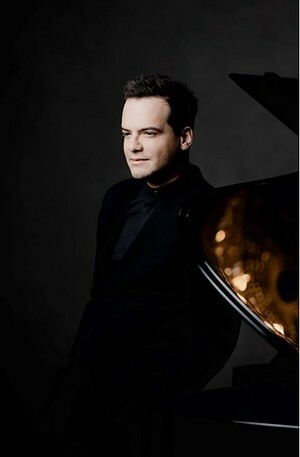 NEW YORK, NEW YORK (March 19, 2019) — Returning to the U.S. after performances at last year’s Mostly Mozart Festival, Swiss pianist Francesco Piemontesi makes his Boston Symphony Orchestra debut in Mozart’s Piano Concerto No. 19 in F major, K. 459 (April 18–20) and National Symphony Orchestra debut in Rachmaninoff’s Rhapsody on a Theme of Paganini (May 30, June 1), while also giving recitals of Bach, Debussy, and Rachmaninoff at Lincoln Center’s Walter Reade Theater (May 19), San Francisco’s Herbst Theatre (May 21), and the Concert Hall at California State University, Fresno (May 24). Mr. Piemontesi, “a one-time pupil of Alfred Brendel [and] a Mozartian to cherish” (The Observer), makes his Boston Symphony Orchestra debut performing Mozart with conductor Andrew Manze, one of his close collaborators in the composer’s music. Mozart’s works occupy a special place in Mr. Piemontesi’s wide repertoire, and he has received particular recognition for his recent recording of Piano Concertos Nos. 25 and 26 with Mr. Manze and the Scottish Chamber Orchestra, released by Linn Records in 2017. Mr. Piemontesi and Mr. Manze recently reunited with the SCO to record Piano Concerto No. 19 for release in 2020. They perform this concerto with the BSO at Symphony Hall on Thursday, April 18 at 8:00 p.m., Friday, April 19 at 1:30 p.m., and Saturday, April 20 at 8:00 p.m. Among Mr. Piemontesi’s Mozart performances in recent seasons, highlights include piano concertos at the BBC Proms, Mostly Mozart Festival, and Salzburg Festival, as well as a recital series of the complete piano sonatas at London’s Wigmore Hall. He also recorded an all-Mozart solo piano album in 2014. In May, Mr. Piemontesi performs recitals in New York, San Francisco, and Fresno that pair the music of Bach with works by Debussy and Rachmaninoff. Bach was a recent focus of Mr. Piemontesi’s programming for the Italian music festival Settimane Musicali di Ascona, of which he has been Artistic Director since 2012, and in his upcoming U.S. recitals, he continues his exploration of the composer’s music. On Sunday, May 19 at 11:00 a.m., Mr. Piemontesi returns to Lincoln Center as part of its Great Performers’ Sunday Morning Coffee Concerts series at Walter Reade Theater, performing Bach’s Italian Concerto in F major, BWV 971 alongside Debussy’s Images, Book 2, L. 111 and Rachmaninoff’s Piano Sonata No. 2 in B-flat minor, Op. 36. Performed at the Alte Oper Frankfurt on March 27, 2015. For his West Coast recitals, Mr. Piemontesi expands the program to also include a late Romantic perspective on Bach, in the form of transcriptions by Ferruccio Busoni (Prelude in E-flat major, BWV 552; “Nun komm der Heiden Heiland,” BWV 659; Cantata No.140: “Wachet auf, ruft uns die Stimme,” BWV 140; and Fugue in E-flat major, BWV 552) and Wilhelm Kempff (Flute Sonata in E-flat major, BWV 1031, II. Siciliano). These concerts take place at San Francisco’s Herbst Theatre on Tuesday, May 21 at 7:30 p.m. and the Concert Hall at California State University, Fresno on Friday, May 24 at 8:00 p.m.
“One of the aspects I especially like about the modern piano is that you have an almost unlimited range of colors and dynamics at your disposal. The instrument can imitate a big tutti of a symphony orchestra or of an organ; it can render the thunderous sonority of a timpano, the singing line of a clarinet, or even the plucked-strings peculiarity of the harpsichord. The first part of the program is meant to explore these characteristics through the original music of Bach and its transcriptions for the modern piano from composers and performers of the 20th century. “For the Italian Concerto I was able to spend several weeks studying on a historical harpsichord; for the E-flat Prelude and Fugue I practiced the piece on the organ; and for the transcriptions I was helped by the recordings of Egon Petri (Busoni´s student) and Kempff´s own splendid account on disc. During this learning period I found it challenging to bridge the gap between the sound world of the harpsichord and the orchestral fullness of the Kempff and Busoni transcriptions. Yet, it has been a fascinating journey to discover Bach through these many different perspectives, and it has been a real joy to translate them into the sound of my instrument. Mr. Piemontesi concludes his 2018–19 U.S. season with his National Symphony Orchestra debut at the John F. Kennedy Center for the Performing Arts on Thursday, May 30 at 7:00 p.m. and Saturday, June 1 at 8:00 p.m. He performs Rachmaninoff’s Rhapsody on a Theme of Paganini on an Italian-themed program conducted by NSO Music Director Gianandrea Noseda, who also leads the orchestra in Respighi’s “Ancient Airs and Dances” from Suite No. 2 and Casella’s Symphony No. 2. Additional highlights of Mr. Piemontesi’s season are performances with the Kammerphilharmonie Bremen with Roger Norrington, Orchestra dell'Accademia Nazionale di Santa Cecilia with Antonio Pappano, Oslo Philharmonic with Marek Janowski, Royal Stockholm Philharmonic with Ton Koopman, NDR Radiophilharmonie and Scottish Chamber Orchestra with Andrew Manze, Swedish Radio Symphony and Helsinki Philharmonic with Mirga Gražinytė-Tyla, Orchestre Philharmonique de Radio France with Ingo Metzmacher, Hallé Orchestra with Mark Elder, and Konzerthausorchester Berlin with Eliahu Inbal.